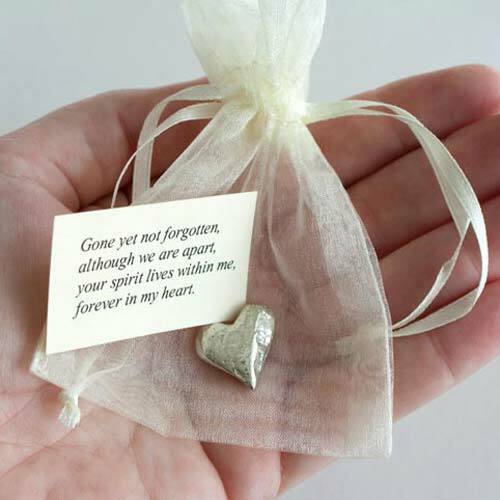 Funeral favors are a popular trend as a way to say thank you to guests and also a way to honor your loved one. These are little trinkets or keepsakes that you give away at funerals, memorials, or life celebration events. 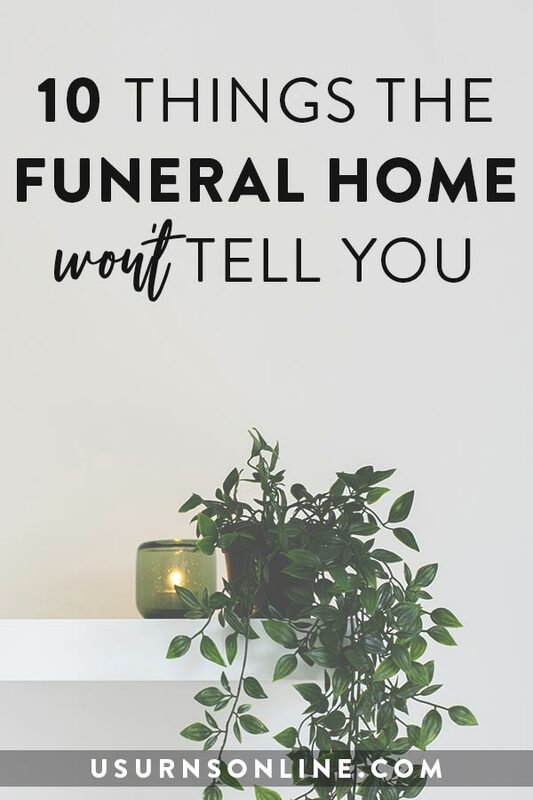 While funeral favors are definitely an “optional” part of your funeral planning, it’s a nice gesture of thanks for the support of friends and family, and it can also be a lovely way to keep your departed loved one in the hearts and minds of all who were part of the memorial service. Funeral favors are a small gift that usually has something to do with the decedent. Often, they are either 1) significant in some way or 2) personalized in some way. For instance, if your grandmother was famous for inviting people over for tea, for a “significant” favor you could hand out little single-serving tea bags in nice wrapping, or perhaps a heart shaped tea infuser. 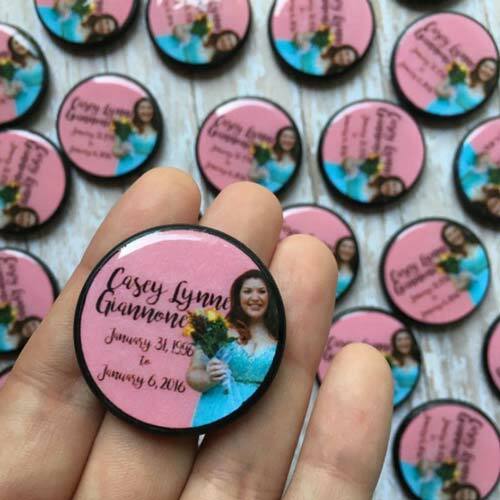 To create a “personalized” memorial service favor, maybe you would prefer button pins with her photo or even printed magnets which could go on the refrigerator so that everyone can be reminded every day of how she touched your lives. 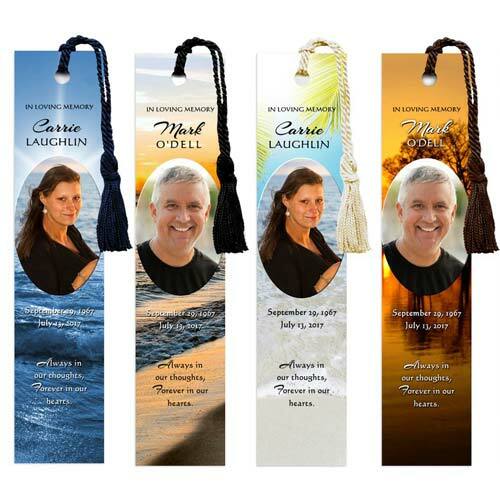 Funeral favors can also be known as memorial service favors, funeral keepsakes, or giveaways. Let’s jump in and explore some of the best and most creative ideas for these funeral gifts. 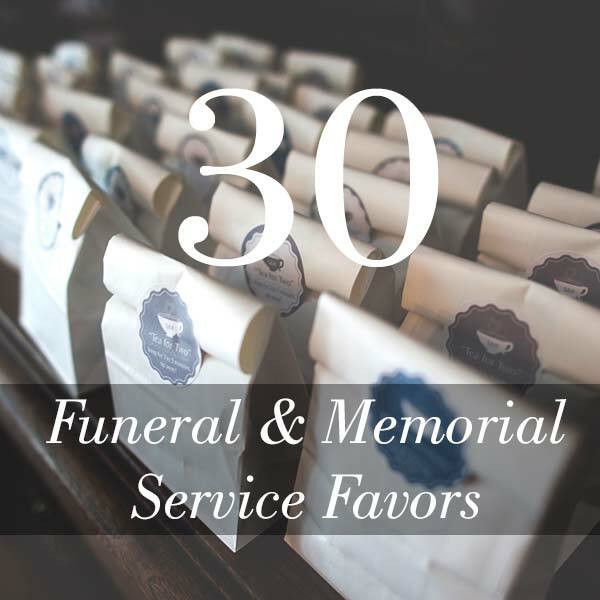 What follows is a list of 25 unique ideas for funeral favors which includes giveaways for any type of service – funeral, memorial service, celebration of life, etc. If you have additional ideas or variations on these, please add them in the comments below! 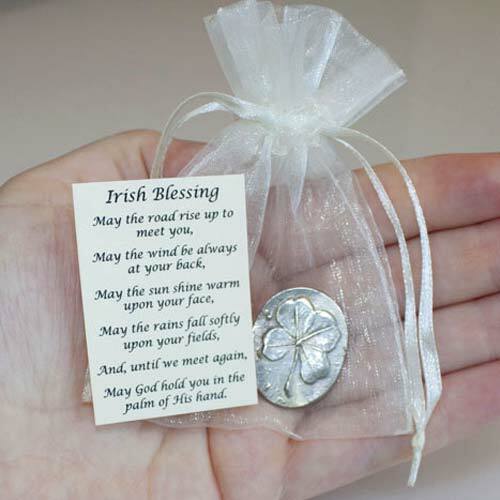 These charms work perfectly as funeral favors, and they are entirely affordable. The little hoop at the top makes it easy for you or the recipients to turn it into a necklace or bracelet. Each charm reads “you are always in my heart” in a lovely handwritten script font etched into the front of the heart. 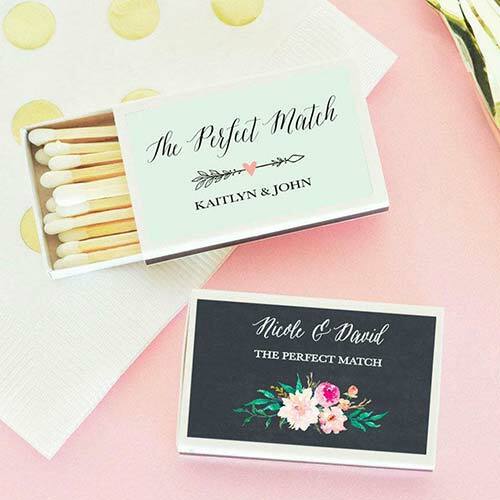 Light a flame in memory of your loved one with these personalized matchbook funeral favors. The contemporary design, floral accents, and modern typography will complement just about any color scheme. Sold here in sets of 50, and includes personalization. Consider giving out custom awareness bracelets at the memorial service for attendees to wear in honor of the departed. 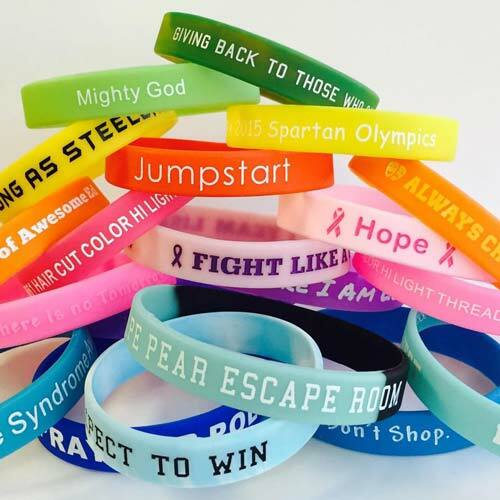 You can get these colorful wristbands personalized with your loved one’s name and dates in a variety of different styles, including printed, embossed, color filled, and more. 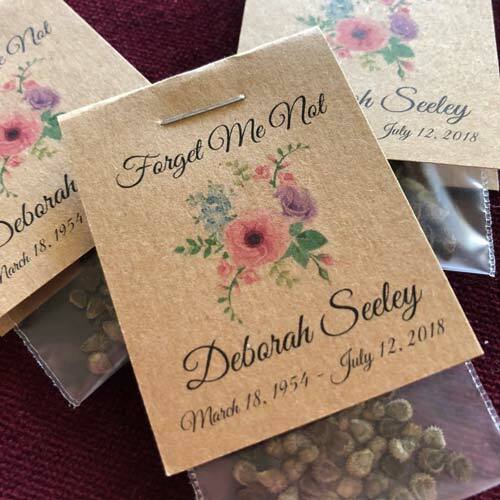 Forget Me Not seed packets are one of the most popular funeral favors to give out at a memorial, and it’s easy to see why. The flower itself is beautiful, blooming in a fragrant image of life in memory of the departed loved one. Of course being called “forget-me-not” contributes to the idea of a memorial. Plus, the seed packets are simple to personalize and lovely to look at. Sunflower seed packets are the same idea as forget me nots, but with sunflowers. Sometimes, the bright cheer of a sunflower is just more fitting than the subdued blues and purples of the traditional forget me nots. These personalized photo memorial magnets come in sets as small as 8 on up into the hundreds. Each includes personalization of name, dates, and a photo, made from wood, and in a perfect size for funeral favors at 1.5 inches in diameter. Get yours here! What a great way to celebrate a tea lover! 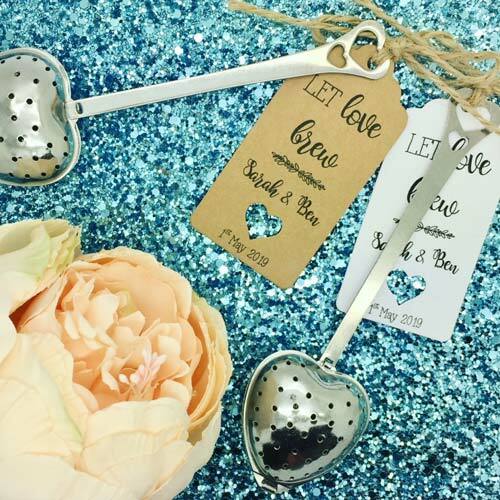 These heart-shaped tea infusers work great as funeral favors for multiple reasons. They are small, affordable, and useful. You can include a personalized note (we would suggest something like, “steep in the memories”) and you get better discounts the more you buy. Available here. 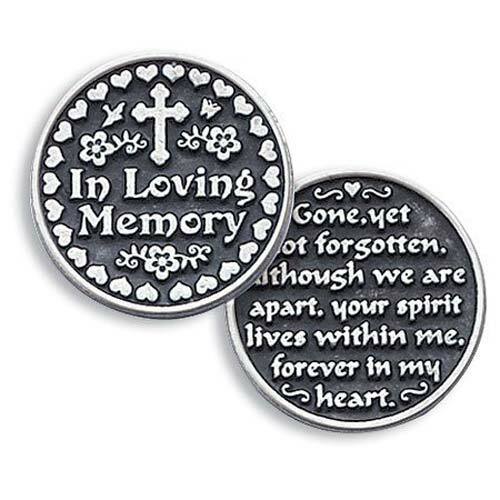 These personalized memorial buttons are a great funeral favor that people can start wearing as they walk in the door. There’s a feeling of unity when everyone – family, friends, coworkers, people from a variety of spheres in life – is wearing the same colorful memorial button. Full customization is included, with photo, name, and dates in several different design options. Personalize yours here. 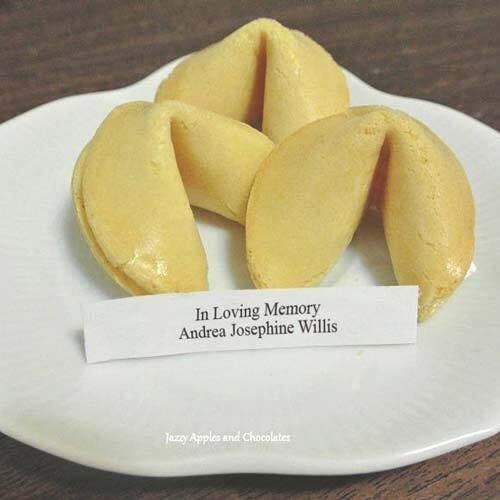 Fortune cookie memorial favors are ideal for creative types. Artists, musicians, chefs, foodies, writers, photographers… they were creative in life, and it makes sense to honor them in a surprising and unexpected way. These fortune cookie favors come in packs of 6 or 12 and include the message of your choice inside. Go with “in loving memory” or name and dates, or come up with something special. For instance, was there an inspirational quote he always said, or was there a song she loved? Did they create some sort of legacy to which you can refer? That’s the sort of thing that would be a delight to open, stirring up conversation about the wonderful life they led and the enduring memories you get to treasure. 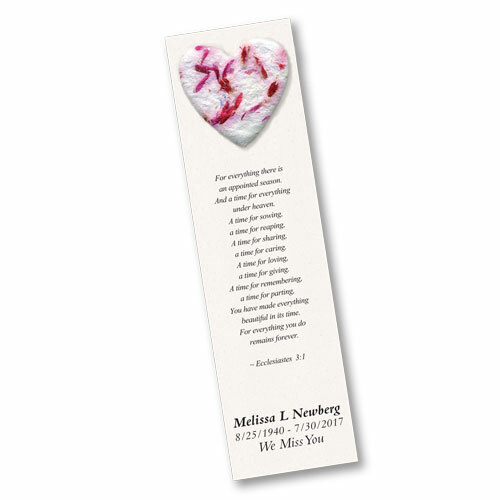 Blooming memorial bookmarks are great for use as funeral favors for two reasons. First, the emblem is made from seed paper and can be detached and planted to grow flowers in memory of the loved one. Second, after the flowers are planted all who attended the funeral will still have a bookmark to keep the memory of the departed fresh in their minds. Options for the seed paper include heart, angel, butterfly, cross, and more. Choose from five different memorial poems, and optionally you can personalize the bookmarks with an inscription of name and dates. Get yours here. Keys go with us everywhere we go. Every time I leave the house, the first thing I grab is my set of keys. 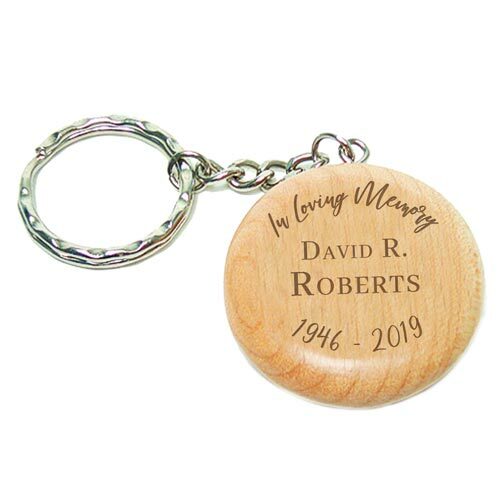 If you want a funeral favor that people will keep close at hand, a keychain is the perfect choice. These wooden keychains are custom laser engraved, so unlike many printed items the inscription will never wear off. Personalize them here. Available here in sets of 25 charms. 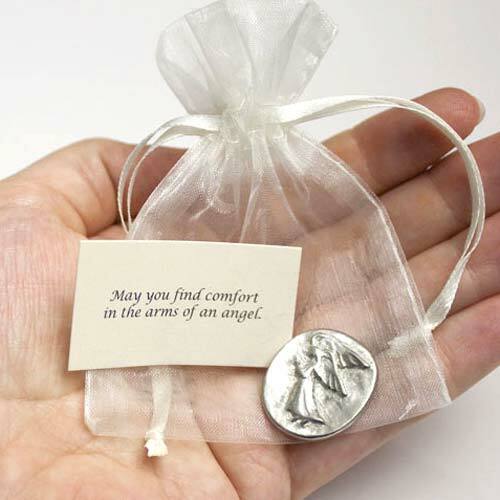 These pewter charms feature an angel with wings in relief, and the card reads, “May you find comfort in the arms of an angel.” Available here. 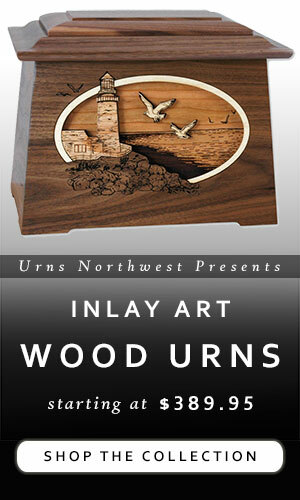 Sold in sets of 25 charms and available at Urns Northwest. The perfect way to light a candle in memory of your loved one. 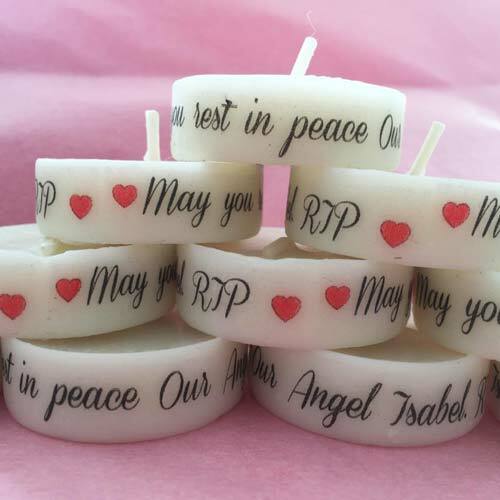 Personalized with any text of your choice, the standard quote is typically “Light a candle in memory of [name].” Available here in sets of 3 candles or more. Funeral favors can afford an opportunity to celebrate something special about the person. 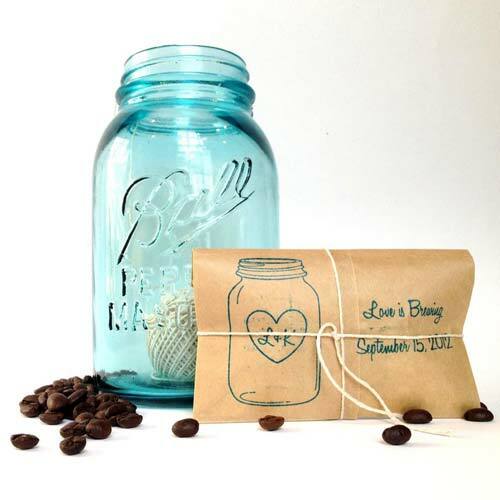 For instance, these favors – cute personalized bags of single-serving coffee – would be ideal for someone who was a coffee connoisseur. You can get these ones here, or get your loved one’s favorite roast and make your own. Perhaps use a customized stamp and get the bags and twine from a local craft store. These memorial tattoos are completely customizable, affordable, and can be made and shipped to you quickly. 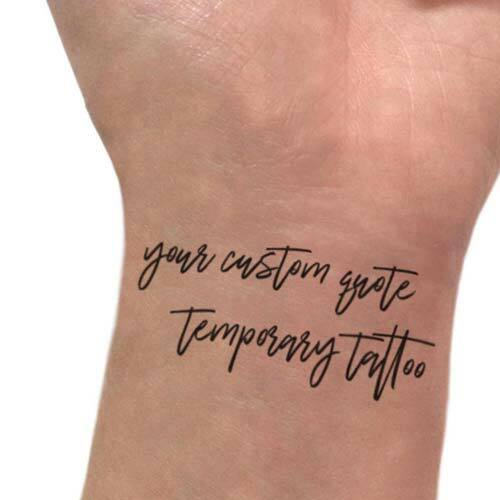 You can have the memorial tattoo be the name and dates, a favorite quote or song lyric, Scripture verse, or simply, “In loving memory of [name].” A creative and unique tribute! 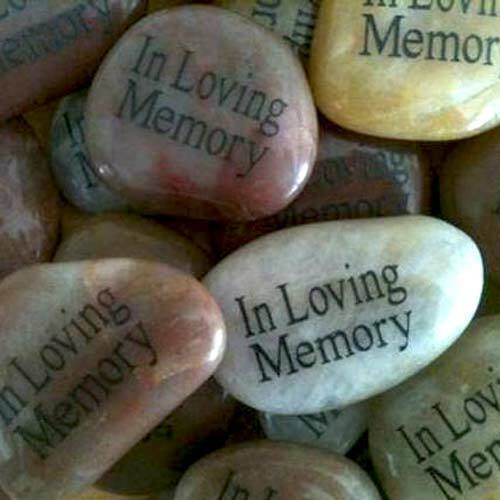 Memorial stones are deceptively simple favors that may actually be used in quite a few ways. Some people might keep it in their pocket and handle it occasionally as a soothing stress-relief stone. 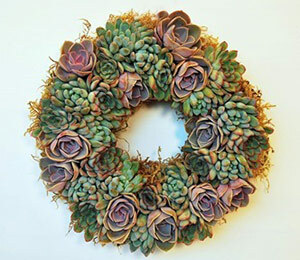 Others might include it in a garden or in some potted plants or other household decoration. Still others might put it by their bedside, keep it in their car, or set it where it will be often seen, in the kitchen or on an end table by their favorite chair. 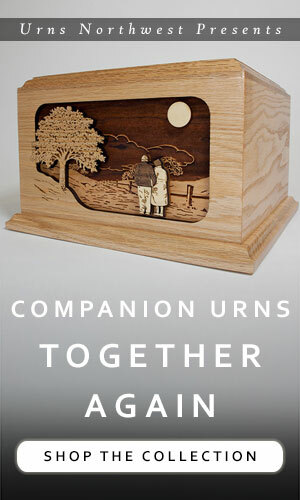 It’s an understated memorial with a natural feel, bringing memories of your loved one to mind in an effective way. Available here. 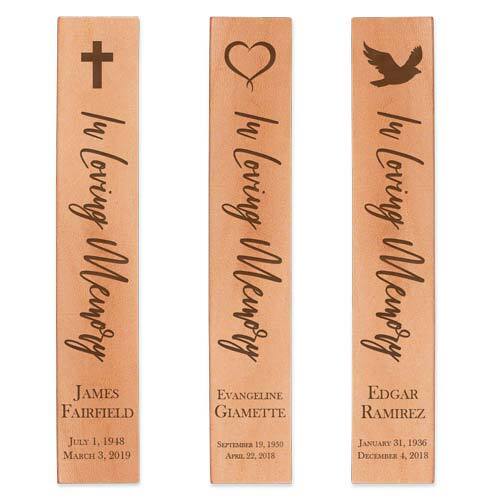 These leather bookmark memorial favors are extremely durable. You can personalize them with custom laser engraving, which will never fade or rub off because it is permanently etched into the material. A beautiful tribute that can be used daily to mark your place in the Bible, homework, novel, or other reading materials. Personalize yours here in quantities of 5 or more. These bookmarks are colorful and elegant! Each includes personalization of name, dates, and more, plus your choice of background and of course the photograph of your loved one. Available here in sets of 20 or more, and they include your choice of tassel color as well. Ribbons are a recognized symbol of awareness, drawing attention to a worthy cause. For your loved one, it is right and fitting to draw attention to their life and memory. 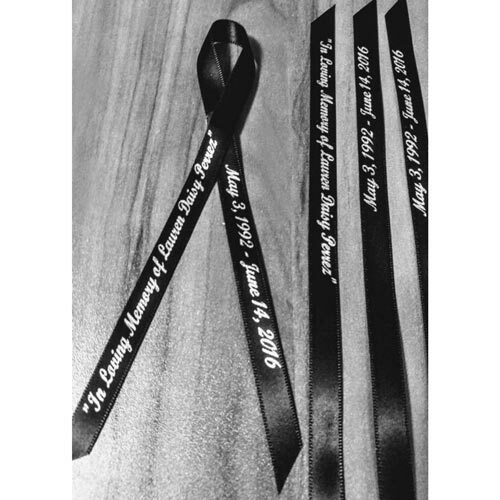 These personalized funeral ribbons are available in traditional black, as pictured above, along with just about every other color that represents a cause. If a condition affected your loved one, you can use these ribbon funeral favors to help raise awareness for that issue. Add pins and friends and family can wear them at the funeral. 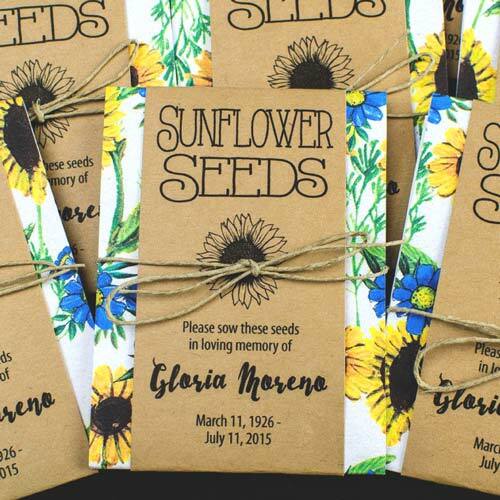 These memorial tree funeral favors are a beautiful way to celebrate life! 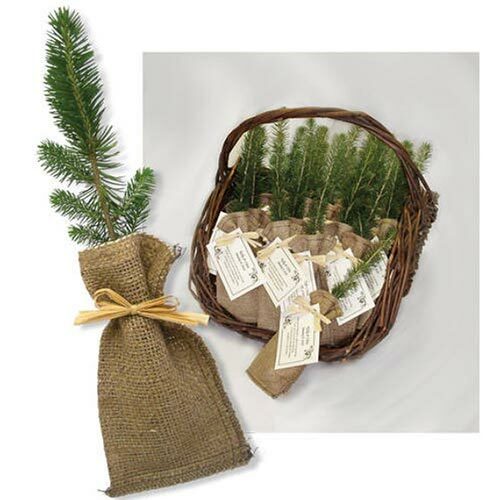 Not only are they rather cute, with the rustic burlap sack and ribbon contrasting perfectly with the evergreen seedling, but they are also symbolic of life. What you sow does not come to life unless it dies. And what you sow is not the body that is to be, but a bare kernel… What is sown is perishable; what is raised is imperishable. It is sown in dishonor; it is raised in glory. It is sown in weakness; it is raised in power. 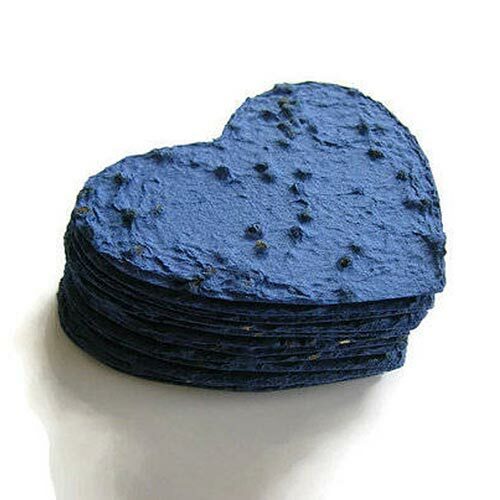 These seed paper hearts are a tender tribute to your loved one. Add a card with a personalized message (there is a super-affordable option at the link, or make your own) and you can easily pass these out as a funeral, spreading new life as the attendees disperse and plant the seed paper hearts in memory of your loved one. 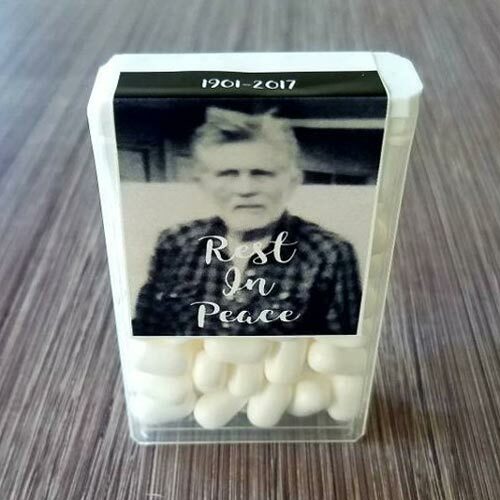 Another quirky choice, these custom Tic-Tac labels allow you to personalize a favorite candy in memory of your loved one. Definitely hand out these funeral favors after the service; you can imagine the distraction of these clinking around in everyone’s pockets. And don’t even think about the noise made when kids get their hands on these… Yes, definitely better to give these away at the reception! Here are some more funeral favors that might be best for just the family, as keepsake gifts. These are popular memorial gifts that are a little nicer, a little more personal, and a little more expensive than the bulk-purchased favors listed above. If you’re looking for something special to give the ones closest to you, perhaps as a thank-you for their help in planning the funeral, these are great options. 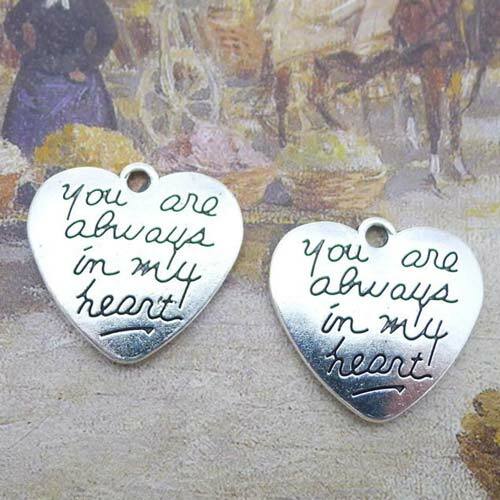 Find more heartwarming keepsake gifts here: 29 Sympathy Gifts for Someone Who Is Grieving. You have three choices for when to give out your funeral favors: before the service, during the service, or after the service. The simplest way to make sure everyone gets a keepsake is to set out the funeral favors before the service. You’ll want to place them in a conspicuous location, typically on a table at the entrance near the guest book. If the favor keepsake is particularly meaningful you may want to give it out during the service. For instance, if you plan to read a poem or sing a song written by the decedent, while you’re introducing the piece have ushers pass out a keepsake tag or bookmark etched with the refrain. Other favors make more sense to give out at the end or after the service. People won’t want to hold on to a memorial tree seedling throughout the service, and you certainly won’t want to hear “bereavemint” Tic Tacs clattering during the moment of silence. 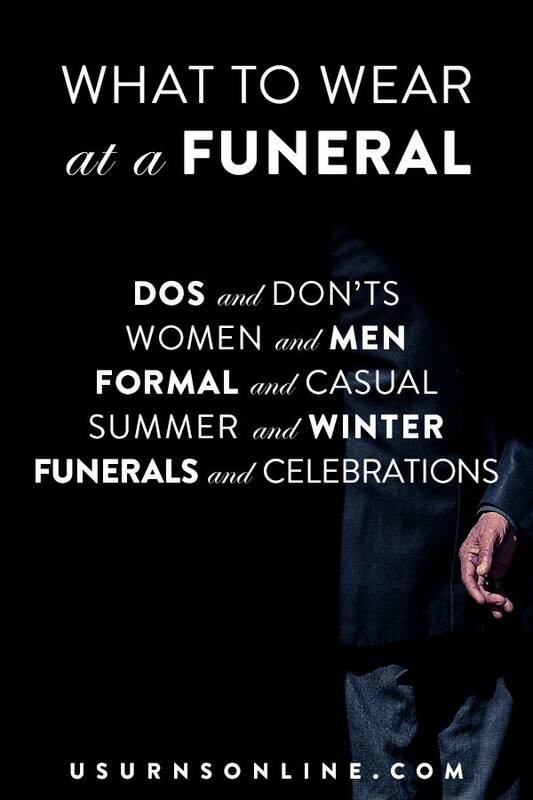 And of course, some funeral favors will need to be explained, and thus will only make sense after the service is over. Your loved one touched the lives of many people. Some will be traveling from far away, and others are canceling plans or setting aside family or leisure time in order to attend the funeral and pay their respects. A funeral favor or giveaway is one small way to show your appreciation for their attendance. Secondly, when you give away keepsakes they serve as physical reminders of the loved one who is now gone. Some will wear, use, or display the funeral favor as a way to show honor, grieve, or say goodbye. Others will put it on a shelf or the fridge as a reminder to pray for the bereaved family. Still others will see the keepsake a week or a month later and send an encouraging text message, or perhaps recall a story from long ago that they share with you, keeping the memories alive. These are just a few of the reasons why you should consider funeral giveaways. They can express thanks, help remind and remember, pay tribute, provide an outlet for grief, or even offer a chance to smile for those who attend the funeral service. What other reasons can you think for why you should give out funeral favors? And do you have any additional ideas? Comment below!